By at least 45,000 years before present, anatomically modern humans had spread across Eurasia [ 1–3 ], but it is not well known how diverse these early populations were and whether they contributed substantially to later people or represent early modern human expansions into Eurasia that left no surviving descendants today. Analyses of genome-wide data from several ancient individuals from Western Eurasia and Siberia have shown that some of these individuals have relationships to present-day Europeans [ 4, 5 ] while others did not contribute to present-day Eurasian populations [ 3, 6 ]. As contributions from Upper Paleolithic populations in Eastern Eurasia to present-day humans and their relationship to other early Eurasians is not clear, we generated genome-wide data from a 40,000-year-old individual from Tianyuan Cave, China, [ 1, 7 ] to study his relationship to ancient and present-day humans. We find that he is more related to present-day and ancient Asians than he is to Europeans, but he shares more alleles with a 35,000-year-old European individual than he shares with other ancient Europeans, indicating that the separation between early Europeans and early Asians was not a single population split. We also find that the Tianyuan individual shares more alleles with some Native American groups in South America than with Native Americans elsewhere, providing further support for population substructure in Asia [ 8 ] and suggesting that this persisted from 40,000 years ago until the colonization of the Americas. 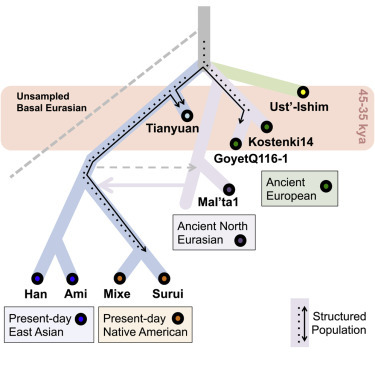 Our study of the Tianyuan individual highlights the complex migration and subdivision of early human populations in Eurasia. Next topic: "UA Research Sheds New Light on Early Turquoise Mining in Southwest"
Previous topic: "Peru: Wood sculptures and other relics found at ancient Chan Chan "